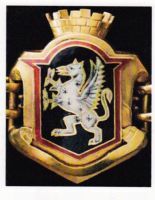 “Sable a griffin rampant sergeant ermine within a border gules"Photo of the link on the Newbury Mayor’s Chain following this appointment. The Arms are based on those used by the Knight family in Newbury 1665. ©Reproduced here by the kind consent of Roderick Thomason, Mace Bearer. 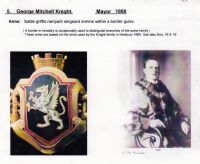 ©from “Regalia of the Town of Newbury, Berkshire” Compiled by Roderick Thomason, and reproduced with his kind permission. The funeral of the late Mr Councillor G.M. Knight took place on Saturday afternoon. Leaving Donnington Square shortly before 3 o'clock, the body was met at the west door of the Parish Church by the Rector of Newbury (Rev. E. I. Gardiner) who read the opening sentence of the beautiful burial service. The psalm was chanted by the choir and the hymn “Mr God my Father while I stray” was sung. The lesson was read by the Rev. W. Pheasant, after which “Now the labourer's task is o'er” was sung. As a recessional the choir sang the nunc demittis and the mournful cortège was reformed and wended its way to the cemetery, where the service was concluded by the Rector. The mourners were M rs G.M. 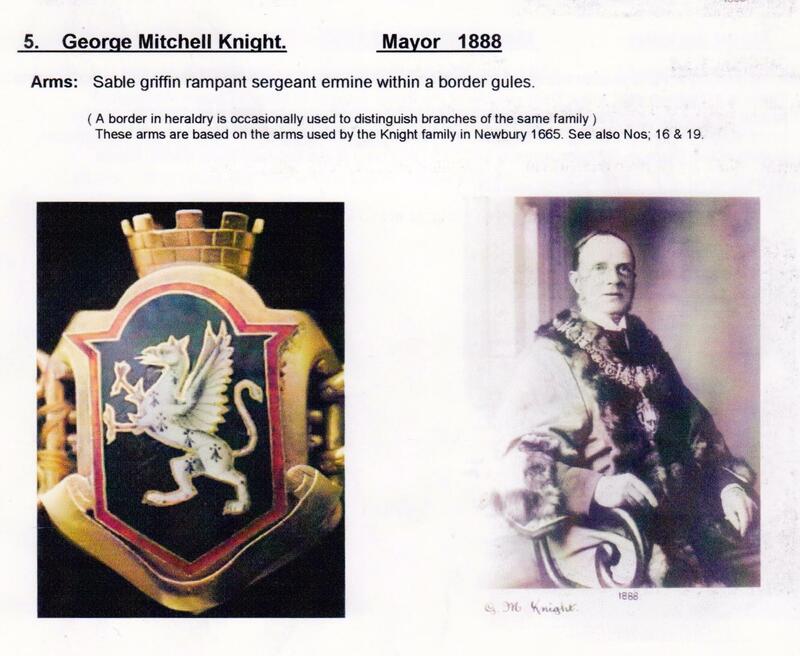 Knight, (widow), Mr Hubert G. Knight, Mr Stanley Knight, Masters Sidney and Edgar Knight (sons), Mr Councillor Stephen Knight (Mayor of Newbury), Mr William Knight (brothers), Mr & Mrs T. Knight, Mr Councillor Hall, Mr W.E. Hall (sons-in-law), Mr G. Watts, Mr Hopwood and Mr W. I. Bravant. The following members of the Corporation and Borough Officials were also present, attended by the mace bearers. The maces being draped: Mr Councillor Long (Deputy Mayor), Aldermen Hickman, Jackson, Lucas, Adey, Absalom, Councillors Elliott, Ravenor, A.Jackson, and Lovell. Mr W, Pettifer (Deputy Town Clerk), Mr A.E. Stickland (Borough Surveyor), and Mr J. Mason (auditor). Amongst those present at Church and ceremony were Rev. J.G. Gibbs,(Vicar of St Mary's), Rev. J. Atkins, Mr H. Burke Godwin (Town Clerk), Dr Kerby, Messrs R. Canning, G.J.Cosburn, J. N. Day, G. Withers, C. Saunders, F.J.Coldicutt, F.J.Harrold, T.W. Graham, E.James, D.R.Jones, J.W.Kemp, J.Edmonds, R.Basing, W. Beams, Pocock, J.Rolfe, J.Pyke, Pearce, T.W. Twissell, W.Edwards, I.Hamblin, S.Knight jun., R.Reeves, A.Percy, and many others. The Royal Standard was at half mast at the Municipal Buildings, as was the union jack at the Conservative Club. The bell at the Parish Church was tolled, and many tradesmen testified to their respect by raised shutters or drawn blind. In accordance with the wishes of the widow and family the Freemasons did not attend in Masonic clothing, although there were a large number of the Brethren present to pay a last token of fraternal respect and sympathy. Newbury Weekly News ? June 1891. Note Mr Knight lived at No. 25 Donnington square.